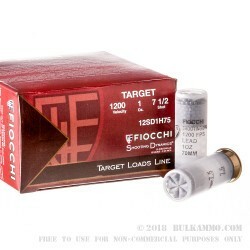 This Fiocchi 12 gauge ammo features the standard 1 ounce load of #7 1/2 lead shot in a 2 ¾” shell in a translucent white color. Upon trigger pull, expect a muzzle velocity of 1200 feet per second out of the barrel and groups well for cheap “shooter” ammo. The reduced velocity and 1 ounce cup size makes this a moderate load with a good recoil profile, meaning you can shoot more in a day without some of the discomfort of the hotter loads. The powders also tend to be very clean compared to other competitively priced shotgun ammunition. 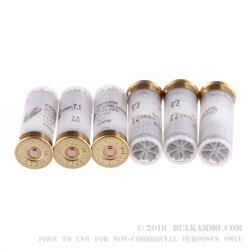 Given the BulkAmmo price, this offers one of the best, if not the best, low recoil sport shooting or small game hunting value. 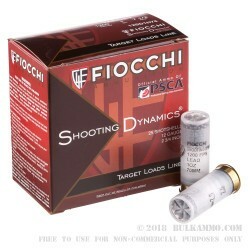 Fiocchi’s proven reliability and long history of providing quality ammunition means this is an easy choice to make if you don’t already have a favorite round. If your favorite round is competitively priced, then you might find a NEW favorite round when you try these. The benefits of the round are significant over most other #7.5 baseline shells. The clean powder burn and the reliable performance in a wide range of shotguns makes this a great choice for any serious shotgun shooter.